Plants require small amounts of salts for growth and development; however, most plants suffer water loss when grown in soils with high salt concentration. Arid regions with poor drainage, coastal regions, deserts, and areas with high rates of evaporation have high soil alkalinity. Halophytes are salt-tolerant plants which thrive under high salt concentrations in the soil. Salt tolerance involves adaptations for maintaining the integrity of plant cells as salt accumulates in plant tissues. 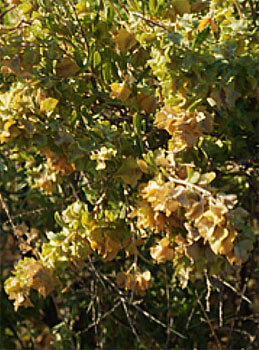 Four-wing Saltbush has leaves with specialized trichomes, or surface hairs, with balloon-like tips called bladder cells. The leaves sequester excess salt electrolytes within the bladder cells. The salts are released back into the environment whenever the bladder cells rupture. Another way of coping with salt is through halophytic succulence as seen in the Pickle-weed. Large quantities of salts collect in vacuoles, or storage compartments within the plant cells. This way, salt is partitioned from the rest of the plant cell and preventing damage. 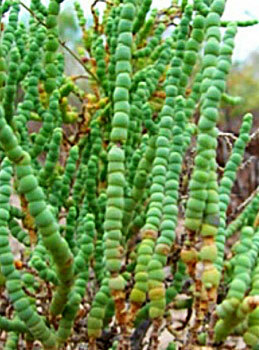 Salts will be removed from the plant whenever a stem is shed or broken off. 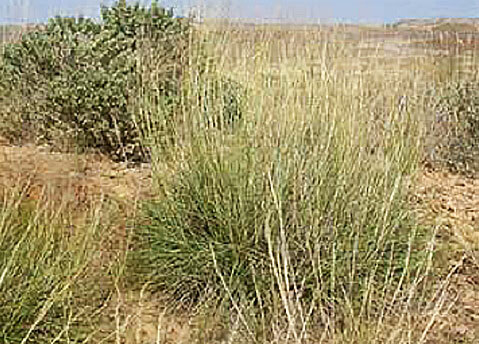 Some plants, like the grass, Alkali Sacaton, are facultative halophytes. They maintain normal salt concentrations by excreting excess environmental salts through the leaves, or by concentrating salts in the leaves that later die and drop off. Facultative halophytes can grow well in a number of habitats as well as in alkaline situations.